T-L Photo/SETH STASKEY WOODEN COURSE teacher Lynn Guerin addresses upwards of 100 Ohio Valley students during a presentation on the Wooden Pyramid of Success last Thursday at Belmont College. ST. CLAIRSVILLE — The John Wooden Pyramid of Success has stood the test of time. Wooden, arguably the greatest coach in sports history, is most known by sports fans for his success and 10 consecutive NCAA Championships at UCLA. Ohio Valley Athletic Conference students have been learning not as much about Wooden the coach, but more about Wooden’s methods to becoming a success coach and person via in-depth studies of the Pyramid of Success. 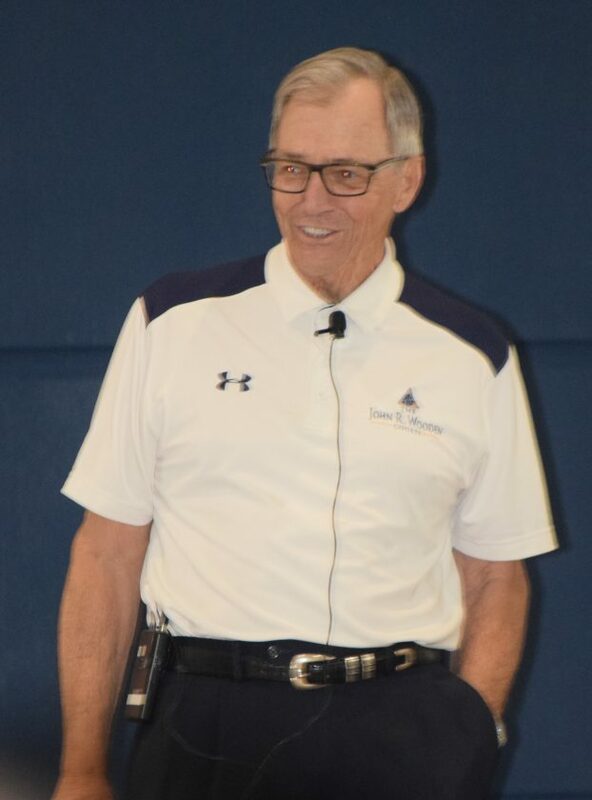 Some 100 students from all over the OVAC were on hand at Belmont College Thursday morning to hear a nearly two-hour presentation from Lynn Guerin, who is the sole teacher of the John R. Wooden course. Though the pyramid remains the same, sometimes success is measured differently and Guerin is able to tailor his message to the audience with which he’s speaking. As he’s addressing high school students, he stressed the importance of them having a coach and/or mentor in their lives. Guerin, who grew up in Shelby, Ohio and played college football at Western Michigan, got to know Coach Wooden through work in the business sector. The two struck up a relationship and began making strong efforts to share and promote the ideals that Wooden was able to build his coaching philosophy from. By almost sheer accident, OVAC Executive Secretary Tom Rataiczak was able to help orchestrate Guerin, who is an Ohio native, visiting the Ohio Valley. Since the OVAC’s Varsity Board had been studying the Pyramid of Success for many months, he decided to purchase a new poster-sized image of the pyramid for his office wall. After several times of electing not to answer the number he didn’t know from southern California, Rataiczak picked up to inform whomever was calling that he or she most likely had the wrong number. However, it wasn’t the wrong number. Guerin was on the other end of the call and explained who he was and that he was checking to make sure the poster arrived and he was curious what Rataiczak was doing with it. The two talked for several minutes and Guerin told him he was from Ohio and loved coming back to the Buckeye State. He said he was coming to the tri-state area and offered to do a free presentation for the OVAC. Guerin actually spent two days in the area. He addressed the athletic directors meeting on Wednesday.